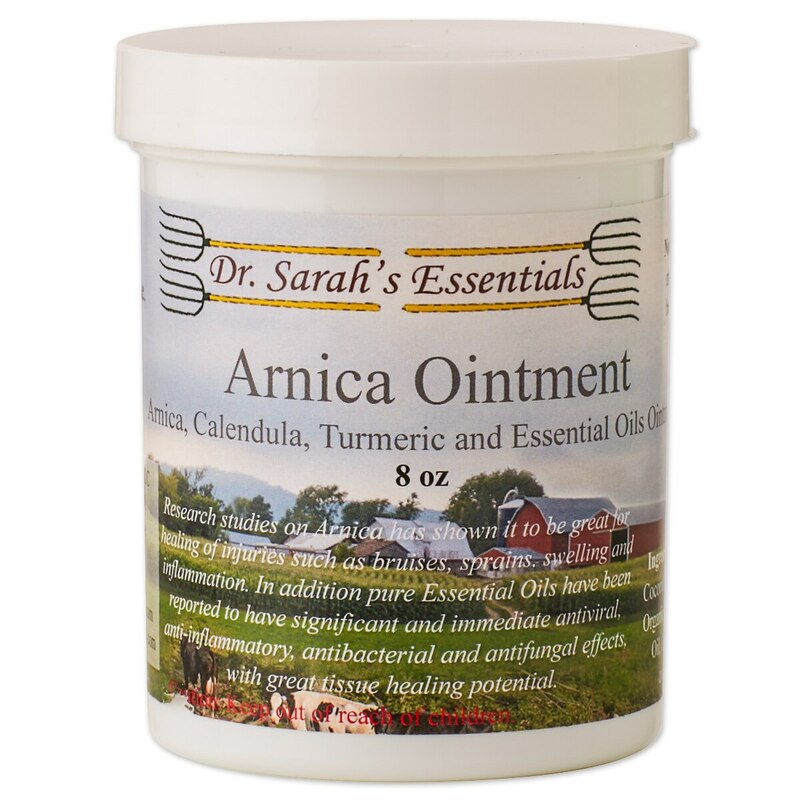 Dr. Sarah's Essentials Arnica Ointment is an all-natural, topical ointment formulated to assist in the healing of bruises, sprains, swelling, and inflammation. Arnica has been shown to reduce inflammation by repairing and strengthening the damaged blood vessels that form bruises. It also helps to minimize the fluid accumulation associated with bruising. These properties are further strengthened by the addition of Turmeric and Calendula Botanical, both of which can be beneficial to circulatory issues and promote the healing of inflamed or damaged tissue. This ointment also contains a blend of essential oils that were chosen for their antibacterialand antifungal properties. Arnica Ointment can be used topically for a wide range of conditions including: bruises, sprains, muscle injuries, wound healing, joint pain, and inflammation from insect bites. Healing ointment for bruises, sprains, swelling and inflammation. Massage well onto bruised, injured, inflamed and infected tissue. Black flecks (normal ingredient) may appear due to using natural raw beeswax; these are not contaminants. Dr. Sarah's Essentials Arnica Ointment is rated 5.0 out of 5 by 1. Rated 5 out of 5 by jandiane from Natural healing Purchased to try natural product to heal small gnat bite on my horses bellies, worked well.